How Does The Tone/Volume Control Of A Guitar Work? 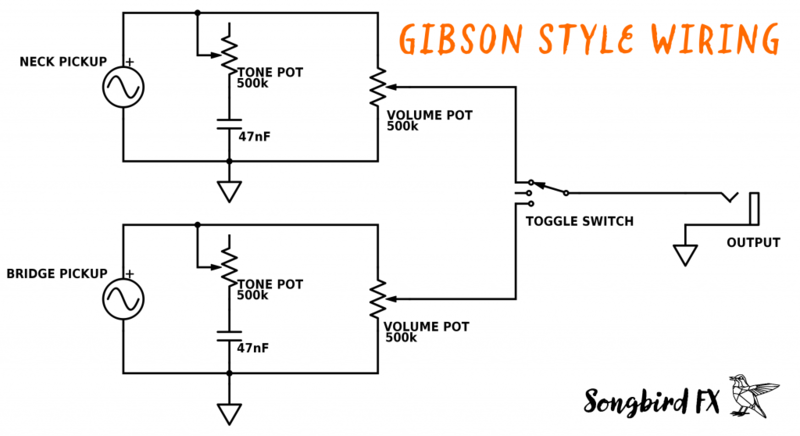 Gibson style guitars usually have two humbucking pickups, a tone and a volume potentiometer for each humbucker and a toggle switch to select the pickup. How exactly are these components wired together and how do the pot settings affect your sound? In this little article I will give you an answer to these questions and tell you some advantages and disadvantages of this wiring scheme. I will also show you the frequency response of the different settings. Please note: the middle position of the toggle switch is not correctly drawn. Actually both pickups are connected to the output in the middle position. In the diagram you can see that each pickup has independent tone and volume controls. The obvious advantage of this wiring scheme is that you can set two independent sounds and easily switch between them via the toggle switch. This is a typical classic rock guitar setting where you can switch between lead and rhythm sound. This setting can be used as a special effect instead of a kill switch: Quickly move the toggle switch up and down to create a tremolo-like effect. One disadvantage of independent volume control is that the mix position of the toggle switch is only useful, if you match the volume-settings of both pickups. If you don‘t, one pickup outweighs the other and you can‘t hear much of a difference to the single pickup sound. Another disadvantage of passive volume control in general is that at lower volume settings the output impedance is very high -> Your signal is more sensitive to electromagnetic disturbances and gets noisier. You don’t have this problem with active guitar pickups. I simulated the frequency response of different settings with LTspice XVII. The signal source I used has a flat frequency response and a 10k output resistance. 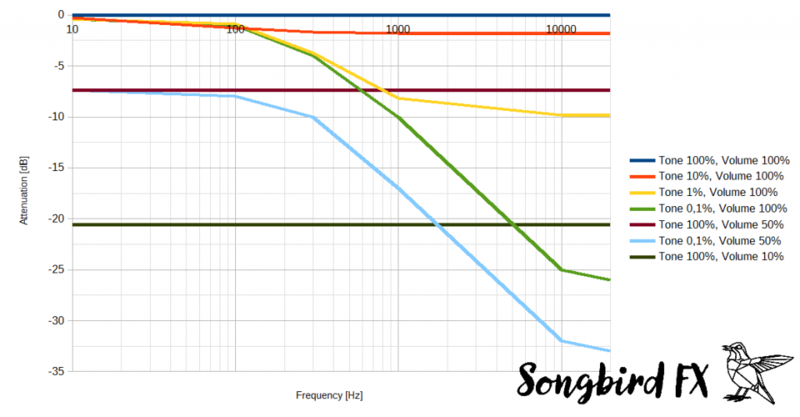 Frequency response: Different volume settings and different tone settings. I hope this article is useful to you. Please check out the products on this website: My company Songbird FX is a manufacturer of high quality micro-USB rechargeable guitar pedals.